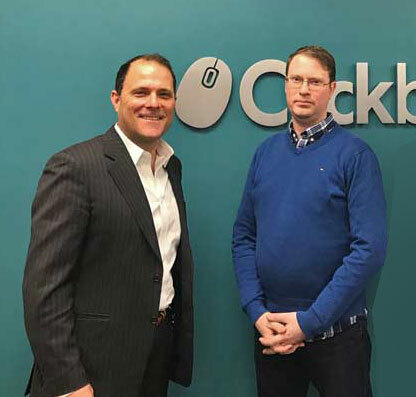 On January 18th, 2018, Mayor Walter Sendzik and Manager of Economic Development Brian York paid a visit to the newly renovated offices of Clickback in downtown St. Catharines. The top floor of the former police headquarters has been completely re-born as a dynamic workspace for the St. Catharines based lead generation software company. From the open-concept layout, to the energy efficient LED lighting, key-fob access, the 6th floor of 110 James is a prime example of cross-generational workplace design. This approach has managed to attract top talent from around the area with an engaging environment and a focus on company culture. The workplace design strategies at Clickback aim to increase productivity, while at the same time allow departments and teams to meet and communicate effectively. This team-based design encourages employees to come together regularly to discuss fresh ideas and innovations. The newly renovated 6th floor of the Tech Hub at 110 James Street. At last year’s State of the City Address, Mayor Sendzik announced the purchase of 110 James, the old police services building by Clickback for their future offices and a Tech Accelerator. The Mayor visited the Clickback headquarters back in April 2017, when the sale of 110 James took place, and has not had a chance to see all of the exciting changes that have unfolded since then until the lunch and meeting on January 18th, 2018. Later this month, Mayor Sendzik will provide an update on developments in the city when he delivers his 4th State of the City Address. The event is hosted by the Greater Niagara Chamber of Commerce and is open to the community. The developments at Clickback and the future of technology and innovation in St. Catharines will be on the list of topics for this meeting. The groundwork for these exciting changes has started and Clickback’s CEO, Kyle Tkachuk, plans for turning the building into a Tech Hub for innovation has begun. Mayor Sendzik enjoyed his lunch and visit with St. Catharines-born Clickback CEO and founder Kyle Tkachuk in the newly renovated boardroom atop 110 James. Additionally, at the meeting with the Mayor and Mr. York, the buildings new name or brand was presented. The 6-story building at 110 James St. is going to be called Accel North. It will become the first ‘Tech Accelerator’ in Niagara and the project aims to become the heart of innovation amongst a flurry of revitalization in the downtown core. The principals of Accel North are Dino Miele, and Kyle Tkachuk. Mayor Walter Sendzik and Clickback CEO and Accel North principle Kyle Tkachuk. Mayor Sendzik and the manager of economic development, Brian York are pumped about the future plans for the Accel North. Clickback has been helping B2B companies turbo-charge their lead growth since 2001. Since then, they have helped thousands of marketers and C-Level professionals solve their company’s lead growth problem with their cloud-based B2B lead generation software products.